If you love phrases like “Meanwhile back at the ranch” and “Head ’em off at the pass,” here’s a book recommendation for you. 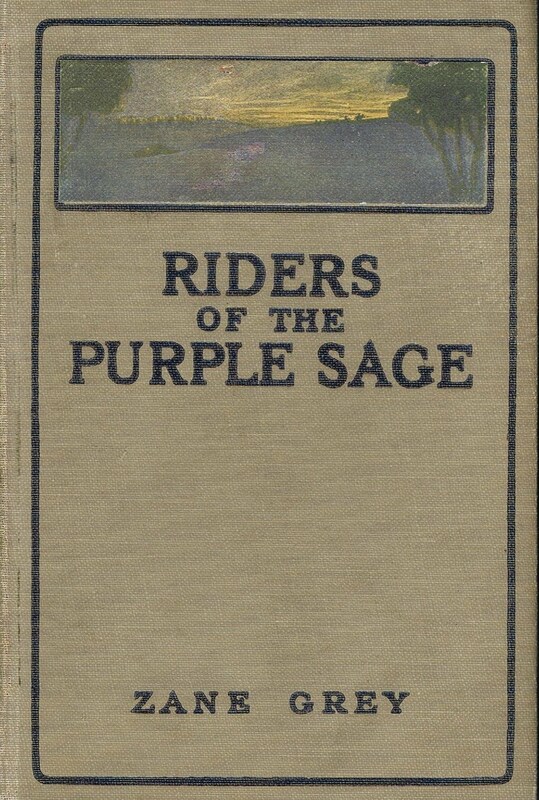 Not long ago, I picked up a used copy of Zane Grey’s classic 1912 novel “Riders of the Purple Sage.” It’s been called the most popular western novel of all time, so I figured it was bound to be right up my alley. I grew up watching TV westerns. Two of my favorite novels of all time—Larry McMurtry’s “Lonesome Dove” and “True Grit” by Charles Portis—are westerns. 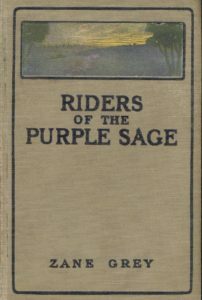 Judging by the “Purple Sage” cover art, which pictures two sinewy cowboys riding their horses down a rocky trail, I was sure to be in for a treat. Set in Utah in the 1870s, the cast of characters includes strong, beautiful women, stoic cowboys with hearts of gold and plenty of bad guys, some of whom are polygamous Mormons who’ll stop at nothing to insure that their religion gains a foothold in this stark but breathtaking land. Not surprisingly, there are also loyal dogs, vast herds of cattle, a couple of tough little burros and some of the finest horses ever to gallop across the west. Black Star. Night. And Wrangler, the bravest horse who ever drew a breath. “Purple Sage” is a well-plotted if predictable story that includes a couple of intriguing mysteries and a never-to-be-forgotten climax. The writing is dated (cowboy dialect includes such words as hoss, mebbe, and jest) but entertaining. And Grey clearly felt an obligation, common among writers of his era, to pepper his prose with adverbs. Passionately. Tauntingly. Harshly. Stridently. Tensely. It’s enough to make a twenty-first century reader laugh out loud. There are frequent reminders that the lead female characters have tremulous lips and heaving breasts. But that’s as racy as this story gets. Both women are pure as Ivory soap. And they, too, can ride spirited horses like nobody’s business. At times, Grey’s writing is hauntingly beautiful. His descriptions of Utah make me long to ride a fine horse, or even a tough little burro, through the purple sage. I yearn to see Deception Pass and Surprise Valley with my own eyes, especially as a thunderstorm rolls in. Like the novel’s main characters, I want to explore the homes of the ancient cave dwellers and ponder for myself whether they were really all that different from people today. Will I read others of the 89 books Zane Grey wrote? Probably not anytime soon. But I’ll never forget “Riders of the Purple Sage.” And I’ll remain forever grateful to Grey for inspiring modern western writers like McMurtry and Portis and Cormac McCarthy. When it comes to books that leave you with that satisfied feeling deep down inside, nothing beats a story about a cowboy and his horse. And a virtuous lady friend with tremulous lips.